Änderung des Einkaufsdatums wegen Ostern auf den 05.04. 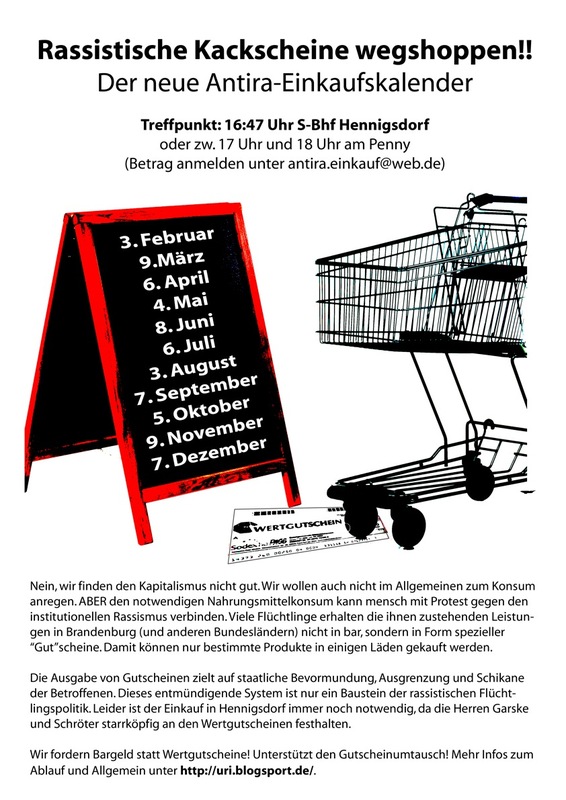 Änderung des Einkaufsdatums wegen Ostern! the somalian refugees detained in Lutsk/Ukraine are still in hungerstrike for their freedom and need more solidarity and support. Please help to spread the informations and take part in the email-/fax-campaign for the freedom of the hungerstrikers. Please help to ask more NGOs, Human Right Organisations, Antiracist networks in your cities and countries to join the solidarity campaign. Du browst gerade in den Corasol Weblog-Archiven nach dem Monat Januar 2012.